ROMEO V. TABUENA | Geringer Art, Ltd.
Romeo Tabuena studied fine arts at the University of the Philippines (UP). He also studied at the Art Student League in New York, USA, in 1952 and at the Academie de la Grande Chaumiere in France in 1954. Tabuena is best known for his depictions of Philippine rural landscapes such as farms, carabao, nipa huts in oil and watercolor media. Often rendered in jewel-toned colors and interlocking cubist-influenced shapes, his earlier works maintain a sense of translucency and fluid form while those from his later Mexican period are more opaque and have a stylized “blocky” quality. 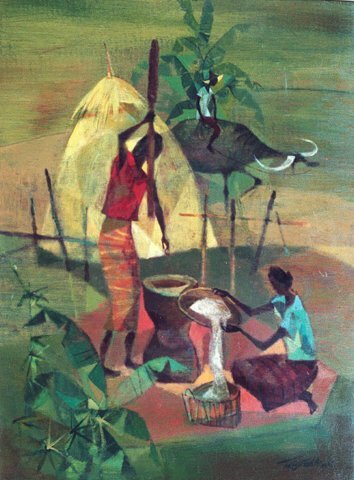 Tabuena began his career with several exhibits of drawings and watercolors at the Philippine Art Gallery in 1949. He is known for his watercolors, at times in a vertical format, influenced by Chinese painting. His near-monochromatic watercolor landscapes of nipa huts, farmers, and carabaos are done in an exquisite style, with attenuated figures spread out in large tonal areas suggesting early morning fog. Tabuena’s early work is often grouped with that of other Philippine Neorealists including Vicente Manansala, HR Ocampo, Cesar Legaspi, Victor Oteyza, Anita Magsaysay-Ho, and Nena Saguil. Tabuena is also admired for his darkly-toned oil paintings which seem to reflect the “proletarian” concerns. His figures are often short and squat, with hints of Expressionist distortion and no bright colors to relieve the charged atmosphere. Tabuena’s style sometimes approaches Expressionism, especially in such a work as Childbirth, in which the pangs of childbirth are expressed in elongated figures that are dramatically lit. A later series consists of heads done in a monochromatic style with Cubist influence, their jagged, angular features suggesting years of toil and arduous struggle. In 1955, he moved to San Miguel de Allende, Mexico where he has painted ever since. Tabuena retained his Philippine citizenship, although he has not since returned to the Philippines. After Tabuena settled in Mexico, he developed a colorful, prismatic style with folk subjects, including street sweepers, candle vendors, guards, and laundry women. In Mexico, he also met and married his Swiss-born wife, Nina. Tabuena has won awards from the Art Association of the Philippines: second prize, Agnus Dei (Lamb of God), 1949, and honorable mention, Black Christ, 1952. Tabuena has participated in exhibitions and staged solo exhibitions — a 10-year retrospective at the Philippine Art Gallery in Manila (1959), a one-man show at the International Salon of the Palace of Fine Arts in Mexico City (1962), and one-man shows in Manila (1973 and 1981) and Mexico City (1975). He was the official Philippine delegate to the Eighth Biennial of Sao Paolo, Brazil, in 1965. In 2007, the Philippines awarded Romeo Tebuena the Presidential Merit Award.